This is a satisfying, healthy supper you can put together in a matter of minutes. 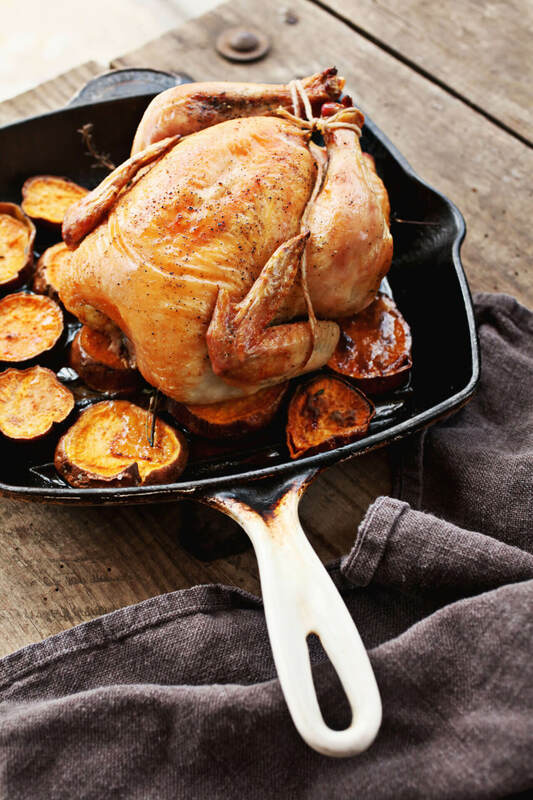 The sweet potatoes sitting directly under the chicken absorb its juice as the chicken roasts, while the ones around the edge take on crisp edges. Try to get some of both in every serving. I like to eat this alongside wilted bitter greens like turnips or arugula. Preheat the oven to 375 degrees. Rinse the chicken and remove any of the innards stashed in the cavity of the bird. If you find it, reserve the neck for this recipe. Pat the chicken dry with a paper towel. Rub the chicken inside and out with 1 1/2 tablespoons olive oil and season thoroughly with 1 1/2 tablespoons salt and all the pepper. Stuff half the lemon and the some of the herbs inside the cavity of the bird. Slice the sweet potato into 3/4 inch rounds. Toss the rounds in additional olive and salt. In a 10-12 inch cast iron skillet or similarly sized baking vessel, arrange the sweet potato rounds so that the bottom of the skillet is covered, but none of the sweet potatoes are overlapping. Lay the additional herbs on top of the potatoes. Truss the chicken if you wish and position it on top of the sweet potato rounds, breast side up. Slide the skillet onto the middle rack of the oven and roast for 1 hour. Bring the bird out of the oven and squeeze the remaining half lemon over top. Serve the chicken warm with sweet potatoes.